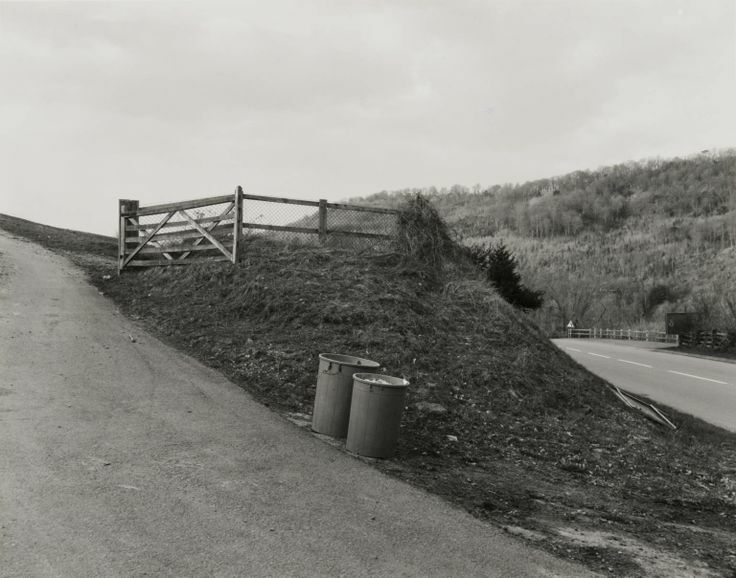 The photography series, Areas Of Outstanding Natural Beauty (1982-1984), was the first work I came across by Keith Arnatt. This was some time before he would eventually be back in vogue thanks to Tate Britain’s well received conceptual exhibition, of which his most famous work, Self Burial (1969), was the publicity image for. Very much like the landscapes that so much of Arnatt’s work captures, it appeared that the artist himself had spent some time being very much overlooked; never quite considered conceptual enough due to working with some level of physical skill with objects (making him outcast from the likes of similar thematicians of Richard Long) but far too bold with such objects to be considered artesian enough to sit comfortably as a photographer (see Paul Nash or John Piper’s photos as examples). With Area Of Outstanding Beauty, the series managed to ask a number of prescient questions, both creative, social, and ecological, because of inhabiting this very liminal area between the conceptual and the physical; an inch or so into either area would tie the work back down into the strange binary of visuality or thematicism that seems to still linger on from 20th century criticism. Copyright © 2017 Keith Arnatt Estate. Does human presence make appreciation of such landscapes ironic? Are human-augmented landscapes taken for granted too readily? This is, of course, entirely dependent on the type of photo that Arnatt is taking. 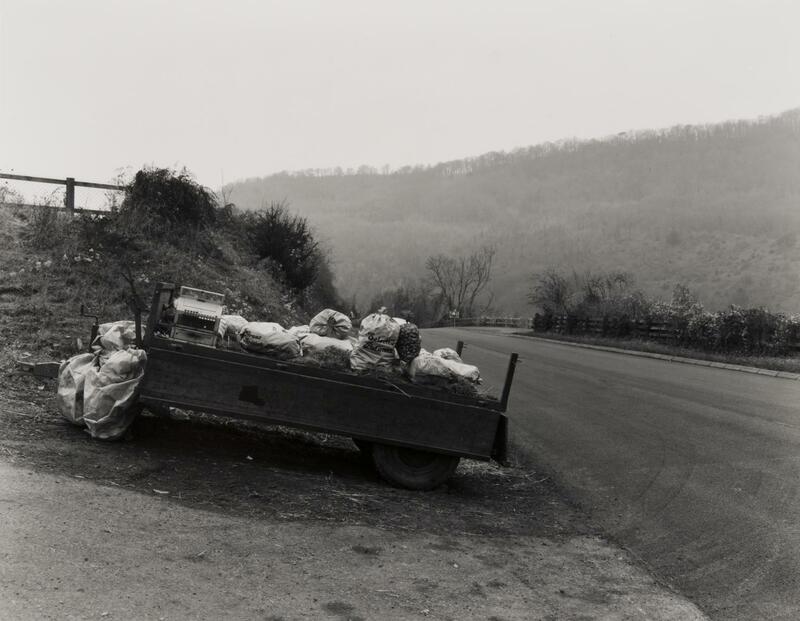 The former question arises in such photos as the beautiful composition of a typical country lane (a typical image of general rural landscape art), where human presence seems intrude upon the image of a rural climb through the presence of a collection of steel rubbish bins. This is a reality of rural environments that many artists throughout the years have sought to conceal behind a curtain of whimsy; the slightest sign of messiness and toil being shrouded or removed entirely. Arnatt seems to suggest that such evidence of a landscape being lived in shouldn’t necessarily be seen as a bad thing, aside from when such evidence begins to encroach upon the other inhabitants of that environment (a theme he would address in other similar works, especially in Miss Gracie’s Lane). This comes over the surprising backdrop of a dismantling of the concept of a society through Thatcherism, and Arnatt reflects wonderfully the sort of environmental implication of a society brutalising itself; where vistas portrayed as pure or unsullied are beyond comprehension in 1982. This is even more alarming when considering that Thatcher’s own environmental policies, while being generally inane, were vibrantly green for the period in question. Are these landscapes all that was left for a the crumbling optimism of the general populace of the era? The point is that landscapes had already been reverting to such a state at the very least in the previous 100 years, if not already strewn with material during the industrial revolution of the previous century. The second photographic element, that of appreciating the human augmented landscape, may seem slightly crass in hindsight; today’s encroaching urban zones seeming to decimate so much rural and organically developed environments with startling efficiency. Yet Arnatt’s asking of this is in a far more specific fashion which suggests that there is another language within the beauty of landscape that is outside (and in many ways opposite to) the received wisdom of the last few hundred years. This was probably not as shocking an argument to make by the time the artist’s work was put on public display. This was a decade after work by the likes of J.G. Ballard which questioned and raised much interest in such spaces, or in books like Richard Mabey’s Unofficial Countryside (1973) which found more than beauty but thriving ecosystems in areas that, whilst aesthetically resembling Arnatt’s landscapes, were show to be full of wildlife. The title of Mabey’s book is also subtly unnerving by suggesting that there is not only a designation placed upon all landscapes but that there is a social hierarchy whose privilege it is to make such decisions. AONB is a quiet rebellion against this group of faceless bureaucrats. The photo showcasing obvious evidence of fly-tipping next to a river differs than, say, the photo of the corner of a car park (which would be apt as being for a country public house), because of this rebellious emphasis. 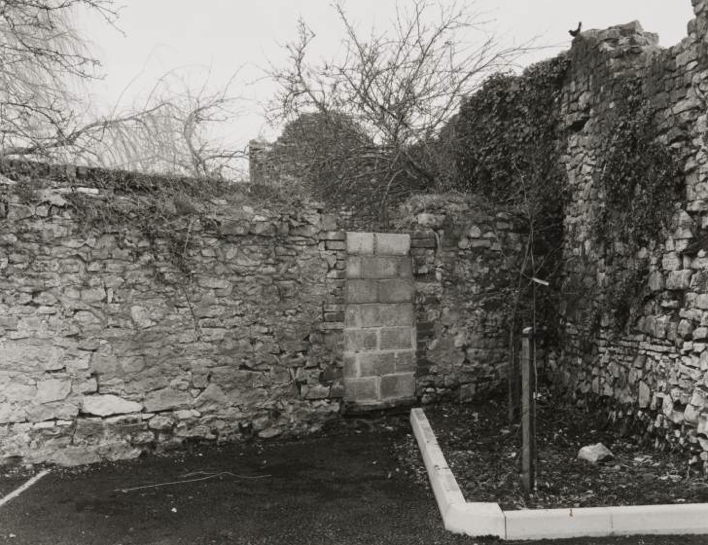 Trees may be landscaped into a small corner of a car-park over the concrete floor of the photo’s lower corner but the ivy has taken its own routes over the walls, the adjacent trees are destabilising the older foundations of the structure – growing over the edge of the top – and who knows what thriving insect life is battling around the tarmac vistas. This is perhaps why Arnatt’s work has more to say than landscape work from the century before; it is very much supplanted in the reality of an environment that the majority of people experience daily and is desperately asking them to take another look; that there is beauty behind the debris of an absent humanity and in the places we have changed. This isn’t simply because of the rebellious nature life that still inhabits it but because of our own transience on the planet; that we are as much a footprint on the beach soon to vanish as the empty bin left alone on a country road. We will soon be gone, by contrast to the time that the land itself experiences, and our stain will eventually be cast beautiful by our absence. Steel bin calling cards, a refuse autograph. A really inspiring post, thank you. I’ll certainly be checking out Arnatt’s work. There’s a lot to unpack here, but as someone who has been guilty of making sure the proverbial bins are out of shot I’ll definitely be reconsidering how I interact with and record the places I visit. I also think this articulates the feeling I have wandering past odd tufts of weeds, or even sorry-looking office flower displays. There is something powerful in nature finding its way into the human-built world, as much as there is seeing how we encroach (if that is the right word) on nature.